Rooibos also known as ‘red bush’ is not strictly a tea, but rather a fynbos plant that grows in the wild Cederberg region of South Africa. This is the only place on the planet where rooibos flourishes naturally, a vital part of a unique indigenous ecosystem. Here, locals have passed down knowledge about growing and crafting the finest, environmentally-friendly rooibos for generations. For centuries Khoisans, the indigenous Bushmen of the Cederberg region, harvested the leaves from the Aspalathus Linearis plant. The leaves were used as herbal remedies and loved for their delicious taste. The rooibos tea history nearly ended with the dwindling of the Khoisan tribes. Luckily the leaves were rediscovered in 1772 and revived a more widespread interest. But it wasn’t until the late 1960s that this rooibos tea history took an incredible turn. Hundreds of studies found more and more about this fynbos tea antioxidants and other health benefits. 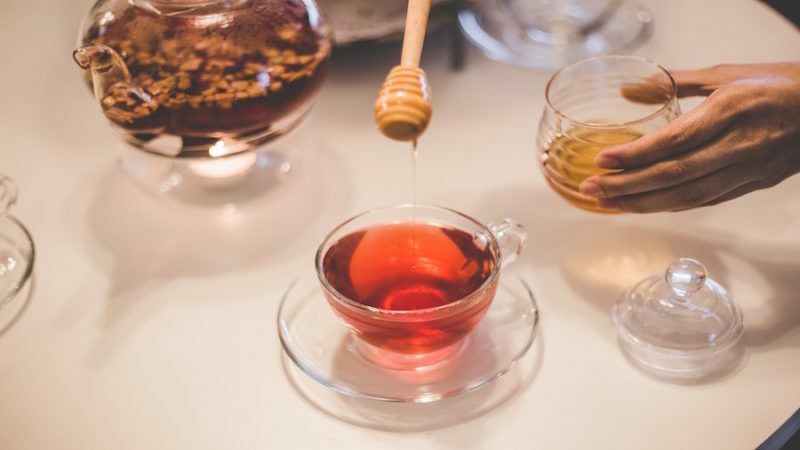 So with this new medical understanding of rooibos, the tea’s popularity exploded. Now I hear you thinking why choose Beleaf & Co’s Rooibos tea, especially since there are so many options in the South African shelves available. I will tell you why, our tea is 100% indigenous and it of course taste delicious. But more importantly it is produced by the Heiveld Co-operative, which is committed to promoting the socio-economic development of the Suid Bokkeveld community through fair and equal pay. The benefits of the sale are passed directly on to members, who are local small-scale farmers. There is also good news for the foodie lovers, not only can you drink Rooibos either cold or warm. It’s also a ingredient to cook with. Combine the cabbages and rocket together in a salad bowl. Grill the pineapple with a little bit of cayenne pepper. Whisk the dressing ingredients together. Just before serving, scatter the sesame seeds and pomegranate rubies over the salad, and drizzle with the dressing. Top it off with some fresh coriander and enjoy! Co-Founder of Beleaf & Co, I like to share the stories from “farm to table” and introduce you to the people behind your cup of tea.